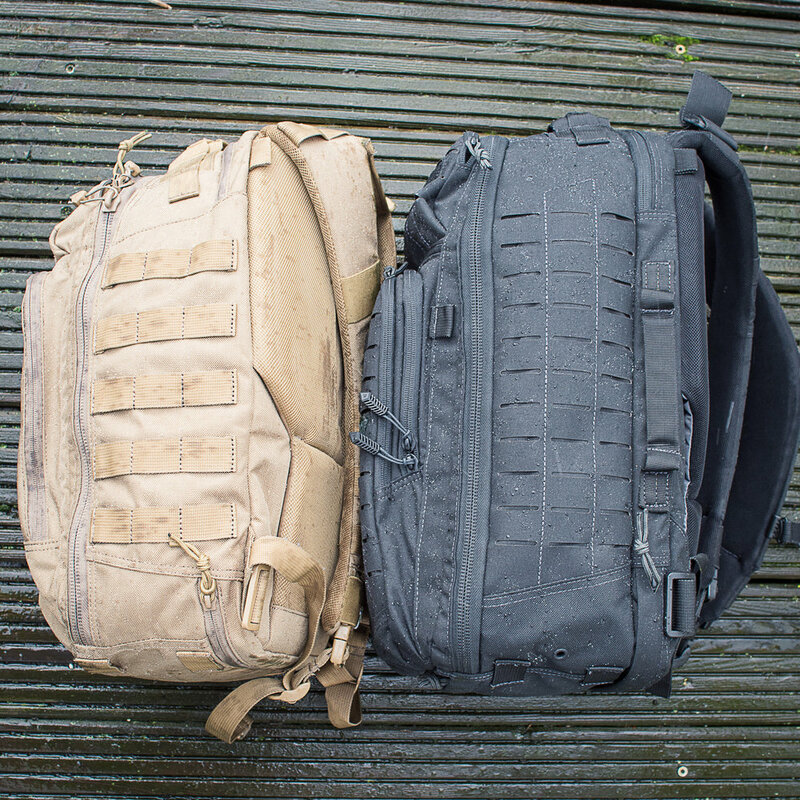 I've long been looking for a smaller pack for urban EDC use, so when I saw that First Tactical was offering two packs intended as half-day packs, I was very excited! I reached out to First Tactical and they were kind enough to provide me these samples to make this side-by-side comparison possible. I'll be deviating from my normal review layout here by breaking it into two parts, as writing up two packs in one post would be too much! So, for Part I, I have included just photos of the packs together and descriptions of the features. Look for the forthcoming Pro/Cons and Design Commentary (Part II) on these packs! The front of the Tactix features an upper pocket, a hidden CCW pocket, the admin pocket and two larger pockets on the face of the admin pocket. As you can see, it is covered with laser cut PALS mounting platform and two areas for patch or name tape attachment. The Specialist features a fleece-line upper pocket, admin pocket and a flat pocket on the face of the admin pocket. There is also a smaller amount of tradition PALS webbing and two areas for patch or name tape attachment. 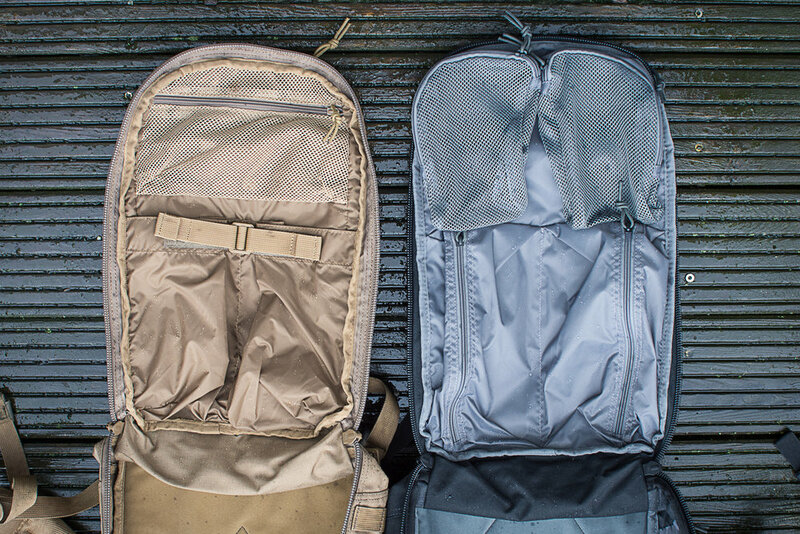 The interior sides of the Tactix have small slash pockets included. The rear panel of both packs are loop covered to accept hook backed pouches. The front panel of the Tactix features two large zipper pockets below (a 20oz bottle will fit here, for instance) and two mesh pockets above that are mounted with hook & loop and are removable. The Specialist features two top loading pockets on the bottom with a strap closure, which will also accept smaller bottles. Above is a fixed mesh pocket with zipper closure. The admin pockets on both packs are very similar with various slots and sleeves for gadgets. Both have a nice removable key fob included and a small hook for other gear. Both display the standard label here where the owner can write their name. The Tactix has one more full width sleeve pocket on top of the zippered pocket in the read. The sides of the Tactix have three columns of laser cut PALS, a low profile grab handle, a grommet for drainage and a couple of small webbing tabs for attaching other straps or accessories. The sides of the Specialist have three columns of traditional PALS webbing and the small small webbing tabs. You can also see here the 1.5" triglides on both packs intended for use mounting a waistbelt (available from First Tactical, but not included). The top of the Tactix features access to the rear Hook and Hang Thru pocket, which has two small slash pockets in the top (you can just see my passport peaking out of one here), a fleece-lined pouch in the top center and you can see the upper pocket I referred to on the front of the pack. The top of the Specialist features access to the rear Hook and Hang Thru pocket and you can see the upper pocket I referred to on the front of the pack. Both packs feature top grab handles of the same basic design. The back panel of the Tactix is built around a removable frame sheet and a "U" shaped aluminum stay that behaves like dual stays. The panel has raised pads in the shoulders and lumbar to allow for comfort and ventilation. It will accept the First Tactical Waist Belt. The back panel of the Specialist is built around a removable frame sheet and the panel has raised pads in the shoulders and lumbar to allow for comfort and ventilation. It will accept the First Tactical Waist Belt. The shoulder straps on the Tactix are covered in laser-cut PALS and feature a sliding sternum strap. The "yoke handle" seen on the top of the shoulder straps is adjustable and the shoulder straps can be adjusted up and down to fit the user. The shoulder straps are a bit wider and thinner than those on the Specialist. The shoulder straps on the Specialist are covered in traditional PALS and feature a sternum strap that mounts to the PALS. The "yoke handle" seen on the top of the shoulder straps is not adjustable and neither are the shoulder straps. Both packs feature a strip of elastic webbing to secure hoses or wires. The bottom of the Tactix has 4 webbing loops for lashing points, a zippered small flat pocket for something like a rain cover and has a rain flap covering the bottom of the Hook and Hand Thru slot. The bottom of the Special has 4 webbing loops for lashing points, and a small hook and loop closure flat pocket. There is no rain flap covering the bottom of the Hook and Hand Thru slot. As you can see, these packs share a lot of DNA, but they are clearly distinct models. Stay tuned to see how they perform and stack up in Part II of the review! Carry one all and God bless you!